A Week and a Half with Bullet Journal – Sanspoint. 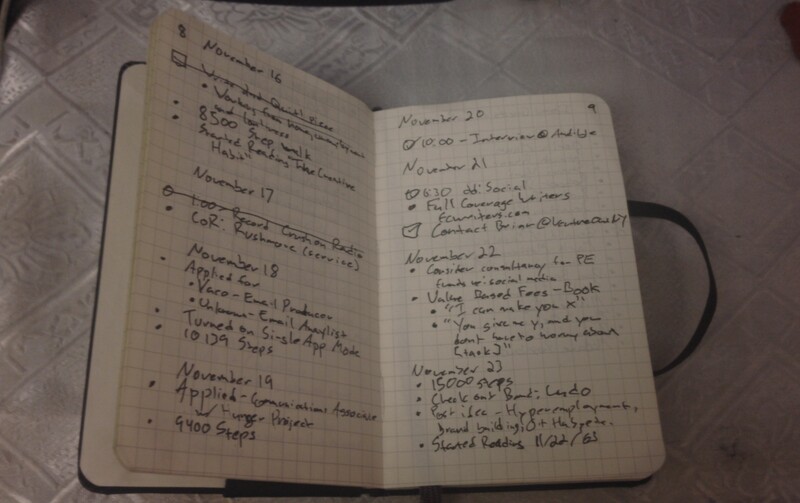 On November 14th, I posted an essay about analog productivity systems. 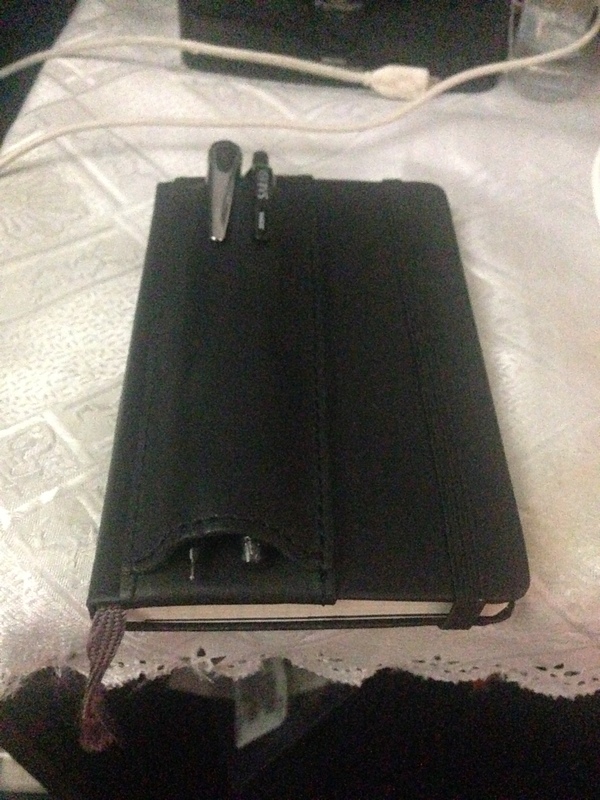 That same day, I went out and purchased a brand new square ruled, pocket Moleskine notebook , with the intent of giving Bullet Journal a try. It’s been a about a week and a half, and I’m ready to report my initial findings. It’s been interesting. Bullet Journal is not made for pocket notebooks, though it’s certainly doable. My monthly calendar for november spans across two pages, and my monthly task list takes up the bottom half of the second page. This isn’t the most aesthetically pleasing option, but I’ll trade aesthetics fro portability. Besides, my atrocious handwriting is going to ruin any elegance the system has. I also noticed that the Monthly Calendar pages do not handle multiple events well. On the 15th, I had three appointments to keep in mind, but I only had room for one on the page. As Bullet Journal encourages succinctness—a quality I lack, as you’ll know from reading other things on this site—I’ll blame myself for this one. Great. Just great. I had the opportunity on day one to really give my Bullet Journal a workout when I attended a lecture at Columbia University on news, computational linguistics, and social media. I scribbled away a page and a half of bulleted notes that are succinct enough to recreate the interesting parts of the lecture. 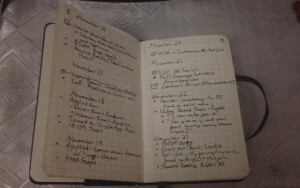 That the notes take up a spread in the middle of my November daily calendar pages doesn’t bother me, as I have both the index and my Moleskine’s built in bookmark to keep my place. I did purchase an accessory to make sure I wasn’t without a pen anywhere I carried my notebook: a double pen pocket notebook Quiver. It took its time getting to me, but I can’t imagine carrying my notebook around without it. I keep a Zebra Sarassa pen in there, along side a Pentel mechanical pencil, just in case there’s something tentative to put down. 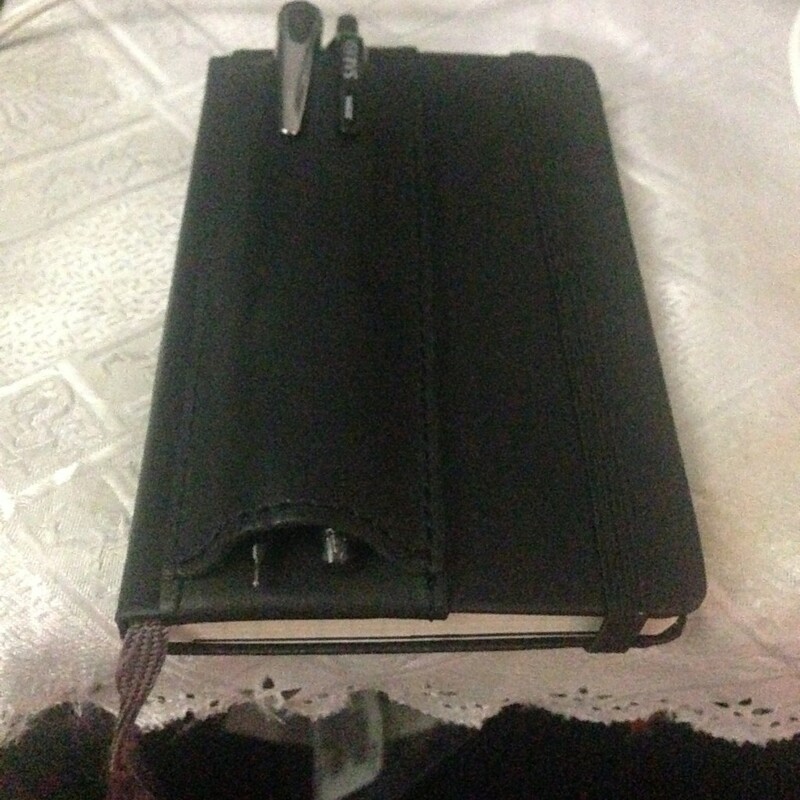 One thing I noticed is that people really like to see you write stuff down in a notebook. When I type things people tell me into my phone, there’s no excitement. On several occasions, writing stuff in my notebook caused people to react very positively. I especially noticed this effect at a technology event I attended, sponsored in part by Google. Let’s see Google Glass be this efficient and reliable, huh? What have I been writing in my Bullet Journal? Whatever seems relevant. Daily steps, notes on calls and meetings, what jobs I’ve applied for, post ideas for Sanspoint and elsewhere—anything that I’ll want or need to know later. Bullet Journal’s found a niche for me as a structured way to capture little bits of data I collect throughout the day, when I know I’ll need or want to refer to them again. Not every day gives me data to collect, but it’s good to have a structure. Bullet Journal is not, however, a task management system for me. If one of those pieces of data I happen to collect is a task, then I collect it and mark it as such with a square box for a bullet. However, I still keep all my to-dos in OmniFocus, where I can manipulate them, organize them, and build them out into projects or subtasks, as necessary for my poor, addled mind. I admire people who can see a task like “Redesign website” and handle it from there. I need more detail, and while Bullet Journal can do that, I would prefer to keep it as a capture system. My handwriting. And remembering to actually write stuff down when I think of it. I don’t know if anyone necessarily needs a full on system to use something as simple as a notebook. It’s pretty intuitive. As Merlin Mann said, “Nothing doesn’t go in here.”  What I like about having a system is that it’s a good MacGuffin for getting me to crack open the damn thing every now and then and scribble something down. More importantly, half of the value of a notebook is the ability to go back and see a snapshot of your life. It’s something I’ve missed out on. Hopefully, using Bullet Journal will give me notebooks full of good stuff to look back on in time.